When I opened the case on the new Bob Marvel 1911 from Nighthawk Custom, I knew I had something special. Nighthawk Custom is well-known for its custom-made 1911s, but it is a relative newcomer compared to Bob Marvel. The pistol includes a lot of hand work, from the glare-reducing stippling on the top of the slide to the smoothing of edges on the ejection port. It seems like everybody and their brother is setting up shop to work on 1911s, but there are a relatively few gunsmiths whose work on the 1911 is legendary. Bob Marvel is one of those gunsmiths, but orders for his hand-built masterpieces are backlogged for years. Late in 2011 Bob Marvel decided that he would help train one of Nighthawk Custom's gunsmiths to build one of his popular models. The result is the Bob Marvel 1911 from Nighthawk Custom— built exactly to his specifications with several unique features you're not likely to see even from other custom shops. This is a Commander-size 1911, with a 4.25-inch barrel and a full-length frame. It is available in black with a Melonite finish or in stainless steel, which is the model I received. This pistol has so many custom touches it is hard to know where to begin, so I'll start at the top and work my way down. First, it locked up tight, with no rattle or shake anywhere, and yet the slide was smooth to operate. Sights are a no-snag adjustable rear matched with a post front that has been dovetailed into the slide. These are three-dot white-outline night sights with tritium inserts from Trijicon. The rear sight is set slightly forward so it is protected by the front of the slide. The round-topped slide is hand-stippled to provide a non-glare finish. I'm not sure I prefer it to a flat-topped and serrated slide, but it is very unusual. The rear of the slide is stippled as well. Not only that, there is a French border at the top of the slide. What's a French border? A very fine line has been etched along the top of the slide on the border between the stippled top and the polished sides. It sets off the difference in texture between the top and sides of the slide. I'm not sure it's functional, but it is pretty. The pistol features a unique, sleeved bull barrel that's perfectly mated to the slide to provide the utmost accuracy. The gun also incorporates the new Nighthawk Everlast recoil system, which is designed to go 10,000 rounds before a spring change is necessary. The slide has unique forward and rear cocking serrations. They actually look dangerously sharp but aren't because they are a bit shallower than standard serrations (albeit more functional). I didn't notice it at first, but the front of the slide is not exactly square. Nighthawk calls it a bull-nose front taper, which means the lower half of the front of the slide angles slightly backward. I really like the way this looks, especially with the barrel cut exactly flush with the front of the slide. The Bob Marvel 1911 has a proprietary bull-barrel system. A precisely machined sleeve is screwed onto the barrel and perfectly fit to the front of the slide for the utmost in accuracy. 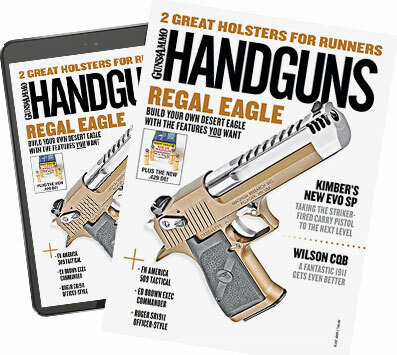 This pistol also comes equipped with the new Nighthawk Custom/Marvel Everlast recoil system, which is designed to go 10,000 rounds before a spring change is necessary. Just about every sharp edge on the slide is removed. There is a heavy bevel on the bottom of the slide, and front of the slide and the entire ejection port have been worked on as well. This is not something that can be done by machine. The pistol has a single-sided extended thumb safety. I don't know if the slide-stop lever is a custom design, but I really like it. The front of the frame has been checkered 25 lpi and slightly relieved under the trigger guard to provide a higher grip. The mainspring housing is checkered 20 lpi and is one piece with the magazine well, the opening of which has been contoured perfectly to the frame. The pistol has a beavertail grip safety with a hump at the bottom to ensure deactivation even if your grip is less than ideal. The author really liked the contouring of the slide stop, one more custom touch on a pistol full of them. The G10 grips are aggressive and attached via Torx screws. The grips are G10 laminate with an aggressive gripping surface. They are secured in place with attractive Torx-head screws, and this is the only complaint I have with the pistol. At some point you will have to remove the grips for cleaning or maintenance, and this might occur at the range or somewhere where you might not have all your tools. Everyone has Allen/hex wrenches, but how many people have Torx wrenches? The pistol was supplied with two eight-round magazines, one blued and one stainless. Trigger pull on my test gun was four pounds and crisp, and accuracy was, as you would expect, excellent. I suspect the pistol was even more accurate than what I'm giving it credit for, but most guns are more accurate than the people shooting them. The Nighthawk Custom Bob Marvel 1911 is only offered in .45 ACP, but what else would you expect?